The most recent month-over-month declines lacked a lot of surprise. September was a standout month for the Mint with its silver sales the highest since March 2016 and its gold sales the strongest since January 2017. Perth Mint bullion sales in October happened against a backdrop of rising precious metals with LBMA prices for the month posting gains of 2.3% for gold and 0.2% for silver. Sales of Perth Mint gold coins and gold bars moved up by 36,840 ounces last month, marking declines of 41.1% from September and 17.4% from October 2018. Year to date gold sales at 308,555 ounces are 1.9% lower than the 314,500 sold through the first ten months of last year. The Perth Mint sold 1,079,684 ounces in silver coins and silver bars in October, dropping 17.3% from September but rising 8% from October 2017. Demand for Australian silver bullion was solid last month despite the slowdown. 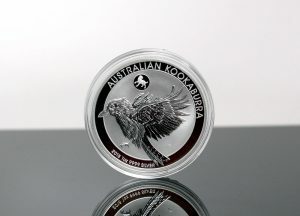 The Perth Mint’s monthly silver sales have topped 1 million ounces only two other times in the last 15 months. Then consider June as a contrasting point, when silver sales totaled just 229,280 ounces for the lowest total since CoinNews started tracking the Perth Mint’s monthly data in February 2013. Perth Mint silver sales for the year so far at 7,673,641 ounces are 6.6% lower than the 8,217,535 ounces sold through the same period last year. Below is a monthly summary of Perth Mint bullion sales from October 2017 to October 2018. The figures show monthly ounces of gold and silver shipped as minted products by The Perth Mint to wholesale and retail customers worldwide. It excludes sales of cast bars and other Group activities including sales of allocated/unallocated precious metal for storage by the Depository.